This article introduces products from a previous model year. To see the latest innovations from TaylorMade, please visit our TaylorMade drivers, TaylorMade irons, TaylorMade fairway woods, and TaylorMade hybrid pages. The new TaylorMade RocketBallz line offers maximum performance and versatility at a mid-level price. RocketBallz clubs also introduce TaylorMade's new "slime green" accent color. These clubs will truly stand out from the rest. 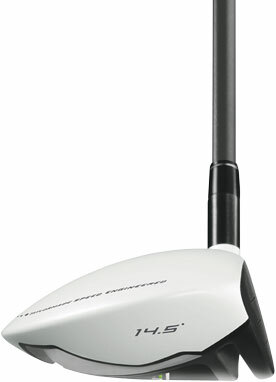 Buy the TaylorMade RocketBallz Driver Now! The RocketBallz driver uses TaylorMade's proven Flight Control Technology (FCT) so you can easily adjust the loft +/- 1.5 degrees and the face angle +/- 3 degrees. The driver also has the exclusive Inverted Cone Technology (ICT) in the clubface to promote speed and distance even on off-center hits. The RocketBallz Driver has a more aerodynamic head design for faster and more effective swings. Its center of gravity has been placed with precision: it has been lowered by the Thin-Thick crown design, moved forward, and placed closer to the unsupported face for powerful launch speeds. The driver also has a slight draw bias to enhance distance. The RocketBallz Tour Driver has many of the same features as the standard model, but there are some key differences. 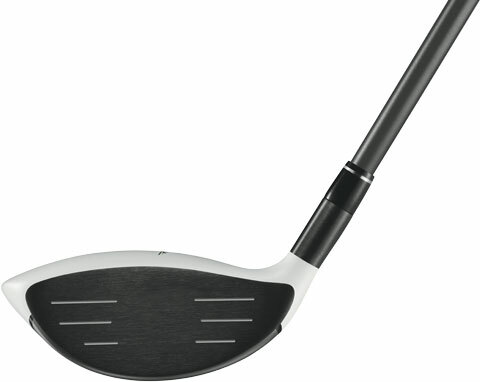 The Tour has a more traditional head shape and a deeper, more rounded face. Its address size is smaller for a more penetrating trajectory and it has a neutral bias for more stability. The Tour Drivers are easy to spot because they each feature a "Tour" label on the toe. All RocketBallz woods have a matte white crown and smooth black face to eliminate glare and make alignment easier. The new "slime green" color is used as an accent to give the RocketBallz its signature look. Buy the TaylorMade RocketBallz Fairway Wood Now! The RocketBallz fairway wood delivers an incredible 17 yards more distance than other TaylorMade models. This is achieved with the help of the speed-boosting Speed Pocket recess in the sole and the forward CG placement, which reduces spin and creates higher launches. The lightweight Matrix XCON 5 shaft and TM 360 grip let you make faster swings for even more yardage. Buy the RocketBallz Tour Fairway Wood Now! The TaylorMade RocketBallz Tour fairway wood has a larger, deeper face with a high MOI head design. Its head is more compact than that of the standard model. It also has a neutral bias and a slightly heavier shaft to give you more control. Buy the TaylorMade RocketBallz Rescue Now! 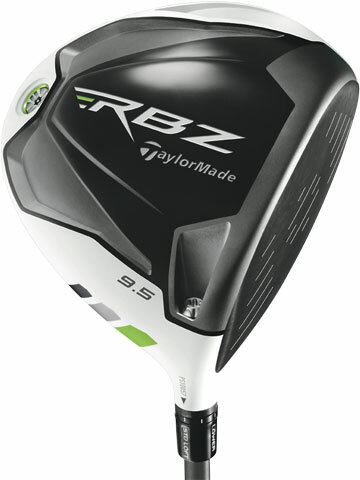 The RocketBallz Rescue (Hybrid) has many of the same features as the RocketBallz Tour fairway wood. The Rescue has a Speed Pocket along with a large and deep face and high MOI head. The Thin-Thick crown design lowers the CG in order to raise launches and create more distance. It also used a lightweight standard shaft and an RBZ iron grip to help you make faster swings. Buy TaylorMade RocketBallz Irons Now! Each of the TaylorMade RocketBallz irons is individually designed to enhance distance and accuracy while providing a great feel. The flexible ultra-thin face raises the COR to the USGA's high ball speed limit for amazing distance. The flexibility can be controlled with the new "Toe-Bar" feature to make shots straighter. The 3, 4, and 5 irons use a two-piece metalwood-inspired construction that lowers the CG and further raises the COR. Another new feature is the vibration and sound control system that dampens vibrations just enough to give you a better feel with a purer sound. The wedges use the new ATV sole to make them extremely playable. The ATV (All-Terrain Versatility) sole allows you make several types of shots with just one wedge. The ATV sole features Toe and Heel Grinds, an ATV channel, and a wider shape so you can use it to play on almost any lie, including sand and the rough. It also has the same precision-enhancing Toe-Bar that the RocketBallz irons have as well as the same vibration and sound control system to give it the same caliber of feel and sound. Buy TaylorMade RBZ Max Irons Now! TaylorMade touts the RocketBallz Max irons as "our longest iron ever" and it has the advanced engineering to back it up. Each iron is individually designed with a two-piece metalwood-inspired construction. The thickness of the faces depends on the iron, with a thicker face for the pitching wedge and a thinner one for the 6 iron. The thinnest face belongs to the 4 iron. As face thickness decreases, its speed increases. Speed is enhanced with the efficient energy transfer created by the tungsten sole weighting, which lowers and centers the CG. The head is draw-biased to promote swing speeds. Add up these speed enhancements and you get incredible distance unmatched by any other TaylorMade irons. 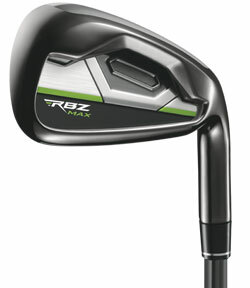 The RBZ Max is also the easiest to hit and draw of all the TaylorMade irons. The TaylorMade RocketBallz series combines explosive performance with a youthful, energetic aesthetic. The forward CG placement is an especially interesting innovation that's unique to the TaylorMade brand. The versatility of the ATV sole makes the wedges extremely convenient and they are sure to become any golfer's go-to wedge. Overall, the RocketBallz series retains the quality that makes it a TaylorMade product while introducing a fresh approach to club design.